With the Scottish Independence Referendum happening tomorrow, it is perhaps worth reflecting on a group of men who are commemorated at Nunhead Cemetery, not by gravestones but by a large memorial – the Scottish Political Martyrs. 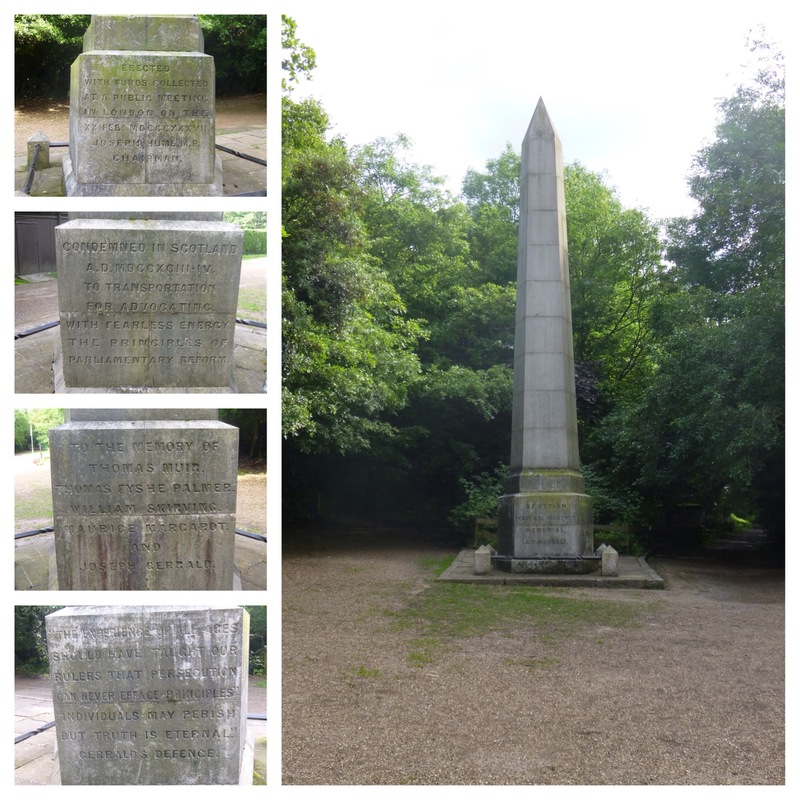 It is a large granite obelisk is unlike anything else in the cemetery and acts as a memorial to five political radicals from the late 18th century – Thomas Muir, Thomas Fyshe Palmer, William Skirving, Maurice Margarot, and Joseph Gerrald who were all transported to Australia. The backdrop to their protests was the French Revolution, which led to universal male suffrage in France in 1792, abolishing all property requirements as a prerequisite for allowing men to register and vote. It is not surprising that events on the other side of the English Channel inspired British radicals wanting similar rights and Societies for Political Reform were set up in many places in the country. Muir was a Glasgow lawyer who had set up the Scottish Association of the Friends of the People with William Skirving, a Midlothian farmer, in July 1792, and seems to have been attempting to bring together the disparate groups across England and Scotland. The “new Tory” Government of Pitt the Younger was determined to stamp out these views, infiltrated the groups and arrested the leaders. In a series of trials with hand picked, unsympathetic juries Muir, Fyshe Palmer and Skirving were all sentenced to transportation, along with Margarot and Gerrard who were delegates from The London Corresponding Society. Of the five, Muir escaped from Australia but was wounded on his tortuous trip back to Europe and died in France in 1799; Margarot returned to Britain but died in poverty; Fyshe Palmer died of dysentery on his return voyage; Skirving died in Australia of yellow fever; and Gerrard died of tuberculosis soon after his arrival in New South Wales. They were not the only trials relating to campaigns for universal male suffrage – three of the other leading London Corresponding Society members – Thomas Hardy, John Horne Tooke and John Thelwall were tried, unsuccessfully for High Treason in 1794. The memorial itself came out of the next significant organised demands for political reform – the Chartists – at a meeting at the Crown and Anchor in Clerkenwell in 1837 it was decided to commemorate the Scottish Martyrs with memorials in both Scotland and London, although it took until 1851 for the Nunhead memorial to be completed. This entry was posted in Cemeteries, Rebels & Radicals, Southwark History and tagged Joseph Gerrald, Maurice Margarot, Nunhead Cemetery, Scottish Political Martyrs, Thomas Fyshe Palmer, Thomas Muir, William Skirving on September 17, 2014 by Paul B.